HOW TO: MAKE THE BEST BOLOGNESE SAUCE IN THE WORLD. Soo I especially have a great heart for all kinds of pasta; I could eat pasta in its variety almost everyday, and I inheritaged this love for noodles from my mom who is a BIG time pasta fan. I think I had 80% pasta in my childhood and maybe 10% rice and 10% potatoes, so it's kinda self-explanatory ;) I especially always loved the classic Bolognese sauce - but unfortunately, for a long time, I wasn't able to hit the mark on that. I of course knew the ingredients (it's not that hard, to be honest, most could tell without looking at a recipe) but somehow, it never tasted right. What followed was a long period of trial + error but with persistence and some good advice from my Italian friends I was finally able to get a sauce nearly to perfection. (That sounds so dramatic but I really really really love pasta!) Since most of you seemed to like my recipe posts I thought of something new to share with you guys! So here comes my personal advice to get you closer to the most best Bolognese sauce you can imagine. Actually, Bolognese is not an ordinary sauce, it's a ragout. And a ragout needs to cook and simmer and cook and simmer for a long time to develop all the distinguishing flavors of the ingredients. A really good Bolognese cannot be cooked in 30 minutes! You can of course make a pretty nice sauce in that amount of time but you will never hit the mark on that, believe me. Never. This was one of my biggest mistakes in the beginning because I usually threw my sauce together in 20 minutes and wondered why it didn't taste what I intended it to taste like. I usually heat everything up and cook/boil it for about 5 minutes, then set to low heat and let it simmer for up to three hours. 3-4 hours are the recommended time for this kind of dish, but I personally think two hours are fine too. It just gets better with that extra hour if you have the time, of course. Another mistake that I made initially, was, that I tried to make the sauce in a single big pot. Actually, a bowl and a frypan work in different ways although they are both very similar to each other. However, different things are happening to your food depending on whether you use a frypan or a pot. So here's what you'll do: All ingredients that are not tomatoes or spices need to be fried first. It makes a huge different if you fry or cook your meat! I usually start with frying the minced meat until it gets a nice brownish color. Then I add onions (lots of onions!) and fry until they get translucent. Next comes the vegetable - always from hard to soft, meaning: Hard vegetables go in first, softer vegetables follow after some time. With this strategy you avoid being your carrots too hard or your peppers too soft. I usually use lots of carrots cut in very small pieces - you can leave the carrots out if you want, but then your sauce might miss that almost not-noticable sweet undetone so I highly recommend using carrots. Also very essential is celery because it develops a special Bolognese-typical flavor when simmering for a long time (A cook once told me you can absolutely not make a Bolognese without celery^^). I don't often have celery at hand, so I mostly use carrots and mushrooms because I love what the mushrooms are doing to the flavors of the sauce. Garlic always comes last! If your garlic turns brown it is very likely to get bitter so only stirfry for about a minute or even less. Just keep a close eye on the garlic, if you see the slightest change then it's time to move from frypan to a pot. Catching up with #1, patience is the key. If you think your sauce is good - let it simmer for an extra 30 minutes, it will just get better with time, believe me! I'm pretty sure you could let it simmer all day but in my case, my pot tends to burn my sauce after 2-3 hours due to the lack of liquid in the sauce after such a long time of cooking. Wow, that turned out longer than expected! Sometimes I wonder if I shouldn't have make a food blog instead of what I have hear because I looove to cook. On the other hand, I don't really invent new recipes, I just try to make the ones I know a bit better. 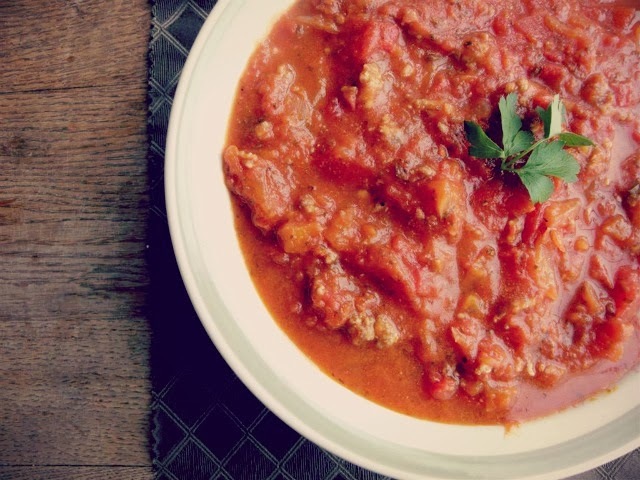 To get this done with, I'll leave you with my favorite Bolognese recipe :) Please enjoy! Makes 2-3 liters (very very big bowl. Possibly serves 6 people with big appetite). I only make big batches of this sauce since it takes so much time until it's done. Wow, this went to a really long post, I'm sorry! I hope you somehow enjoyed this post, I put all my heart and love into it! Hope y'all have a splendid weekend!